An interesting passage in Hebrews opens with a reminder of who we are in Jesus and through Jesus (Hebrews 10:23-25). With this as our perspective, the author tells us four things we should do in response. Let Us Pursue God: The NIV says to “draw near to God.” I like this imagery of us steadfastly moving toward God, getting closer and closer, almost as though he gently pulls us to him. Though we can accept or reject his supernatural yearning to pull us close, we consent to his attraction when we pursue him. May we pursue God as if nothing else matters—because nothing else does. We need to do this with a sincere heart and full of faith. Let Us Hold Onto Hope: Next we need to grasp the hope we claim to have within us. If we say we have hope but don’t act like it, what good is that? Instead our behavior, both in thought and in action, must align with what we believe. And if we face temptation to waiver in our hope, Hebrews reminds us that he will faithfully give us what he promised. Cling to our hope. Let Us Encourage One Another: Third is the reminder to encourage each other. While we can nurture many godly traits in others, this passage specifically mentions two: love and good deeds. It’s as if nothing else matters. The practical extension of love is to do kind things for others. Love connects to good deeds. Let Us Not Isolate Ourselves: We can’t realize all God desires for us if we separate ourselves from his other followers. Together we stay strong. Apart we falter. As the Bible says, “A cord of three strands is not quickly broken” (Ecclesiastes 4:12). The oft-quoted text for this is to let us not give up meeting together, which many misapply (read more about this). The point is to hang out with others who follow Jesus. The details of what this looks like is for us to determine. 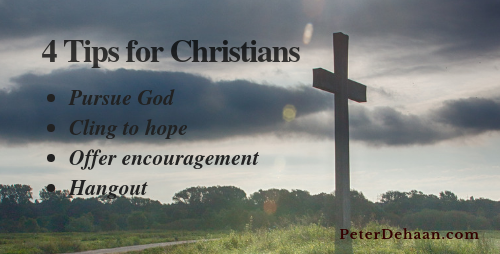 As followers of Jesus, may we pursue God, cling to hope, offer encouragement, and spend time with each other.